A British intelligence agency has targeted a new generation of recruits by advertising in computer games. The Cheltenham-based surveillance service GCHQ hopes to attract the attention of "tech-savvy" gamers. Adverts featuring the GCHQ website are on billboards within Xbox 360 games such as Splinter Cell: Double Agent and Enemy Territory: Quake Wars. GCHQ said it hoped the campaign would "capture the imagination of people with a particular interest in IT". Laura Robertson, who runs the GCHQ account at advertising agency TMP Worldwide, said the aim was to do something different during GCHQ's graduate recruitment season. She told BBC Radio Five Live: "When we heard about this opportunity we decided that it was worth investigating and happily when we talked to GCHQ about it they were really pleased to take it on. "It's been predominantly used for consumer advertising to date, and very successfully, and this is the first time it has been used for recruitment purposes. "Hopefully it just raises your attention and the idea is to encourage you to have a look at the website. "We're just asking people to have a look at it and go and find out more about the opportunities." 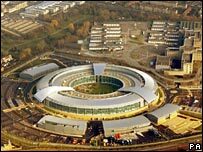 GCHQ, which works alongside the UK's other intelligence agencies MI5 and MI6, employs about 5,000 people and provides monitoring information for the government and protecting its communication and information systems.